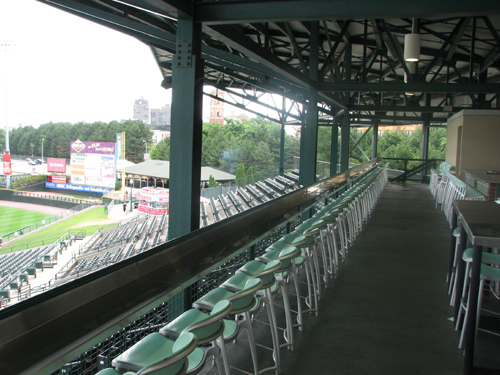 Whenever I meet new people on my baseball road trips and tell them about The Ballpark Guide, the question I’m most often asked is, “What’s your favorite park?” It’s a question that’s almost impossible to answer — how can you compare the history of a 100-year-old park with the amazing, modern amenities of a new one? The way I answer this common question, albeit in a roundabout way, is to talk about which parks I’d pick if I could theoretically relocate somewhere and buy season tickets. 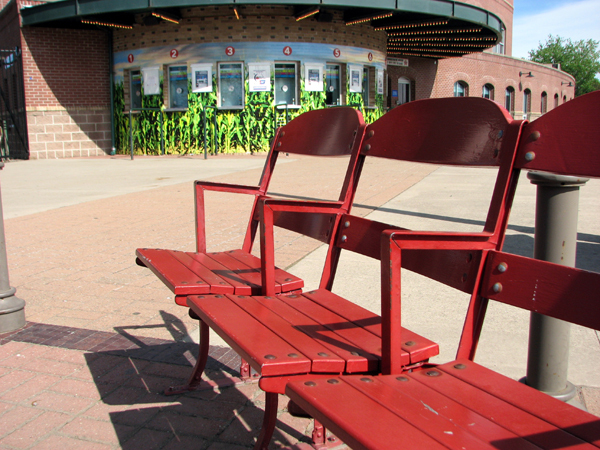 Rochester’s Frontier Field is always on that list. 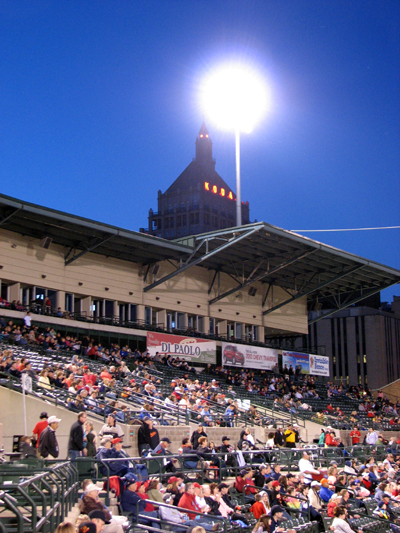 I’ve often said that Frontier Field might offer my favorite all-round ballpark experience, and when I was planning my recent trip, I couldn’t resist kicking things off in Rochester. 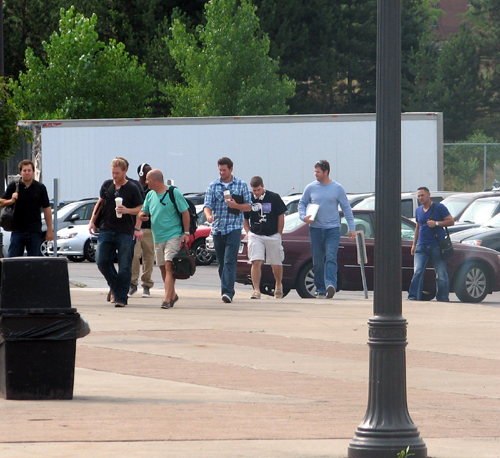 All that said, I was pretty excited to hop in the car the morning of August 29 and punch Rochester into my GPS. 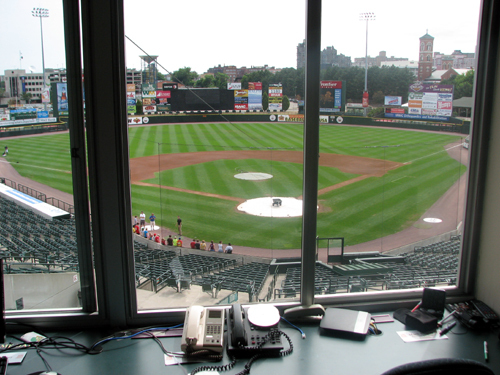 I checked in to my amazing hotel when I got to town (lots more on that later) and made it to Frontier Field shortly before 4 p.m., a couple hours before first pitch. 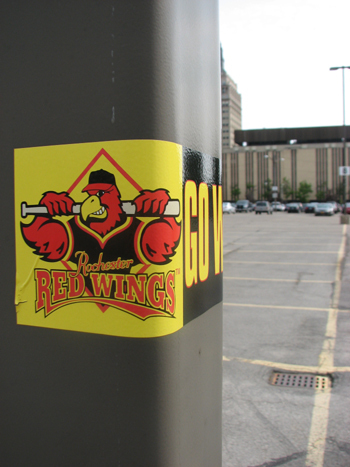 I closely follow the Rochester Red Wings, given my love of Frontier Field, and they were hosting the Buffalo Bisons during this final series of the International League regular season. 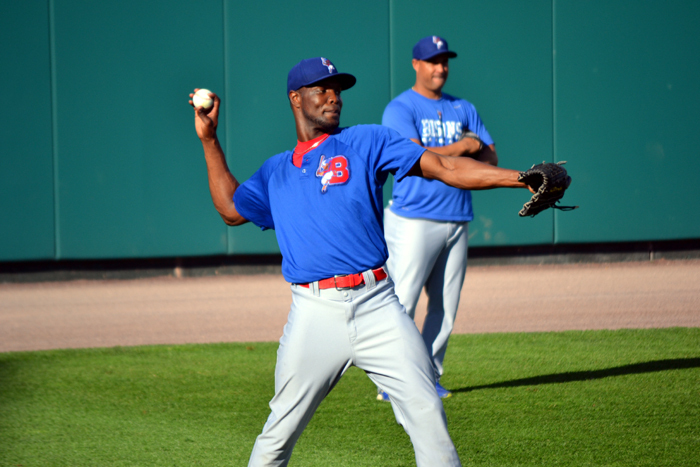 Buffalo, of course, is the Triple-A affiliate of the Toronto Blue Jays, and I hadn’t seen the Bisons in action since they became affiliated with the Jays. 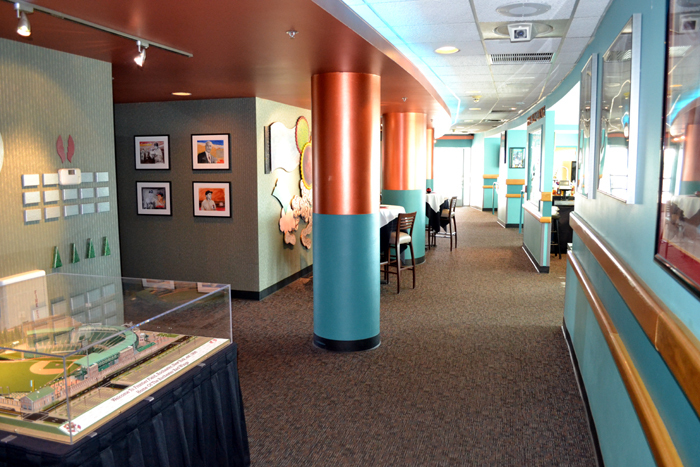 Lots of reasons to get inside and check things out! 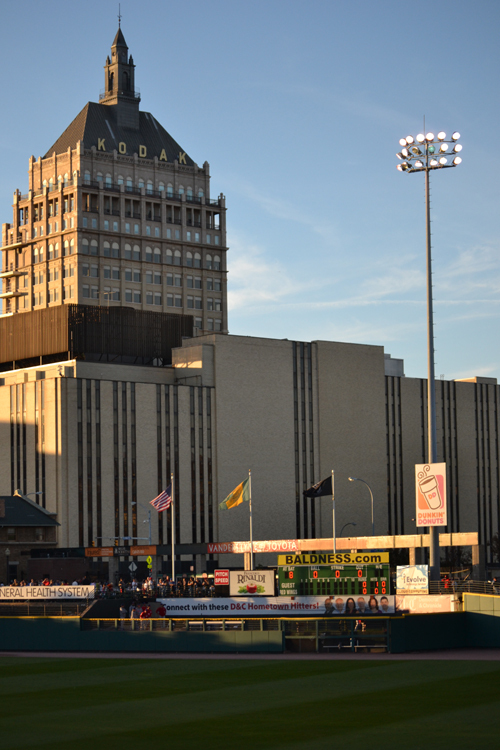 Sure, this building isn’t part of Frontier Field per se, but it’s a Rochester landmark and, given its location virtually across the street from the ballpark, makes for an awesome backdrop. After I took the picture (and exchanged thumbs up with them) the mystery player made his way over to me and asked if the photos turned out well. Yes, I told him. “Are you putting them online?” he asked. “Yes,” I replied, “but if you’d like, I can send you the full-sized versions by email.” He said that would be great, and I gave him one of my business cards. Then, he asked to see the photos. I lowered my camera over the fence and watched as he checked them out. He thanked me for taking them and, since I didn’t want to let him get away without figuring out who he was, I quickly said, “I’m Malcolm,” and extended my hand toward him. “Radhames,” he replied, shaking my hand. I instantly knew he was Radhames Liz, a former Baseball America top-100 prospect and pitcher for the Balitmore Orioles. 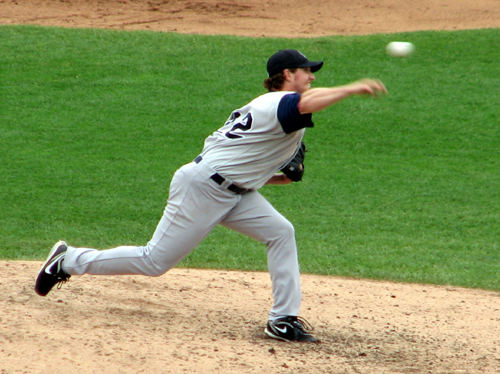 He appeared in 28 games for the O’s over three seasons, including a stint in 2008 in which he started 17 games. 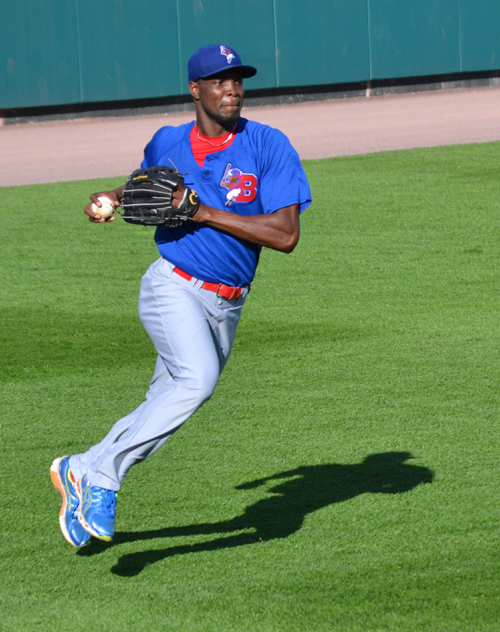 After spending 2011 through 2013 pitching in Korea, Liz signed with the Blue Jays and started 12 games this season between Double-A and Triple-A, putting together a tidy 2.95 ERA. Anyway, he’s yet to email me, but I sure hope he does. And if not, he’ll certainly be a guy I’ll keep tabs on and try to meet again. Occasionally, Liz seemed to get the sense that I was still shooting him, so he’d look over the give the peace sign or a nod. 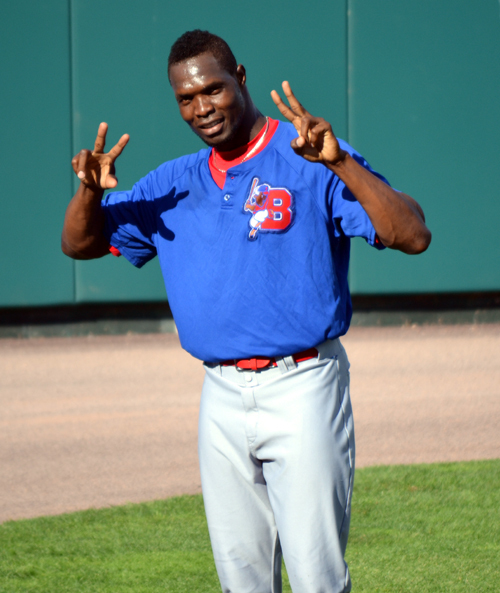 When BP wrapped up, he gave me a salute as he headed off to the dugout, and then I continued making my way around Frontier Field. As I was eating, a family consisting of a pair of grandparents and a young boy sat down in front of me. They asked me to take their picture with their camera, and after doing so, I figured I could do one better. 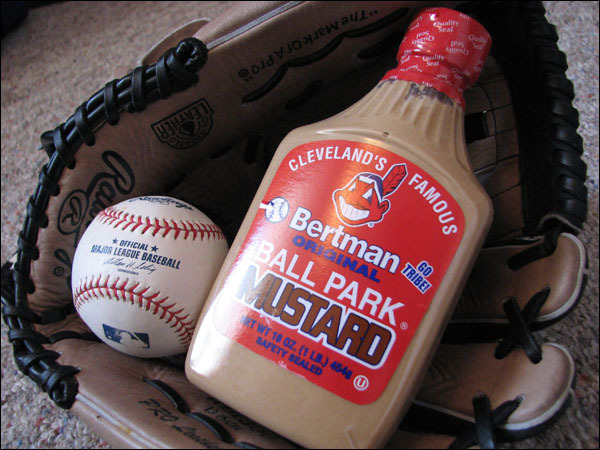 I reached into my backpack to grab the baseball I’d found earlier and handed it to the boy. He was thrilled, although I think his excitement pales in comparison to my wife’s when I told her I wouldn’t be adding another ball to my collection. It’s typically tough to find a game-used bat from a top prospect, let alone one from a visiting team. 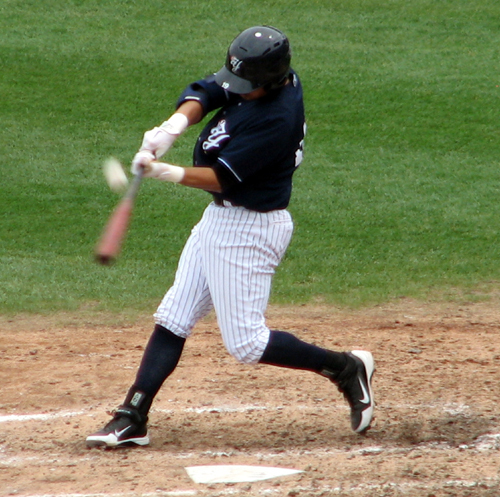 Furthermore, did he break this bat during the day’s batting practice? It seemed so fresh that it couldn’t have been around for long. It looked brand new, except for a few ball marks and a crack along the handle. 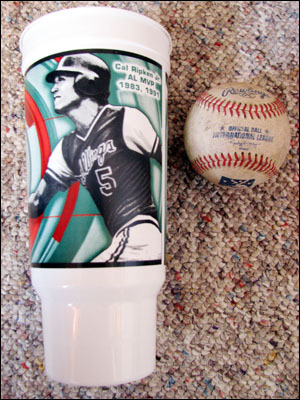 The display indicated that game-used bats were $25, while bats from MLB players were $50. 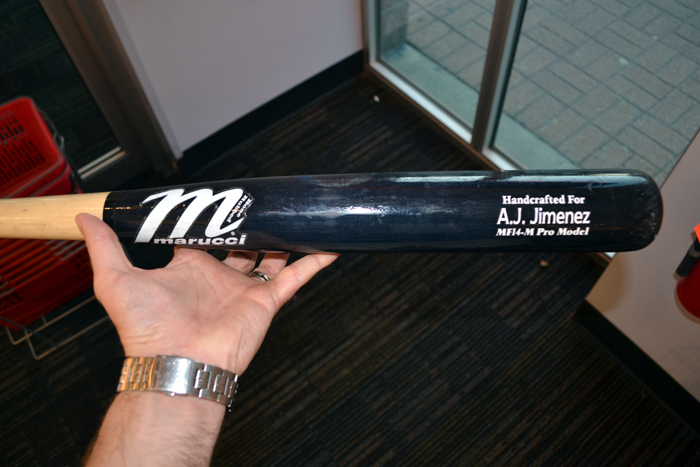 Jimenez’s bat obviously belonged to the former category, so I was thrilled to find it for such a bargain. 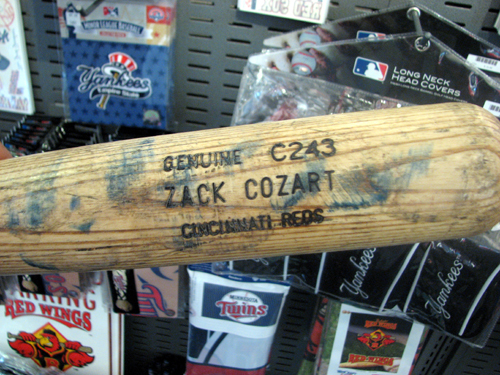 I stepped to the counter to buy it, and the clerk told me the the bat was $50, as it belonged to an MLB player. I pointed out that Jimenez has yet to appear in the big leagues, and offered to show her proof online. She was uneasy about giving me the bat for $25, so I didn’t want to press the issue. 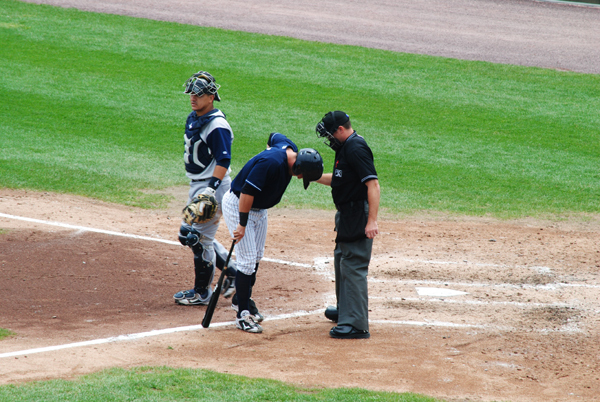 At the same time, I didn’t want to spend $50 for the bat, so I begrudgingly returned it to its barrel. Oh well. I was pretty amused to watch it — I assume the remote-control helicopter was being piloted by someone in the parking lot — and kept looking around me to see if any other fans had noticed it. 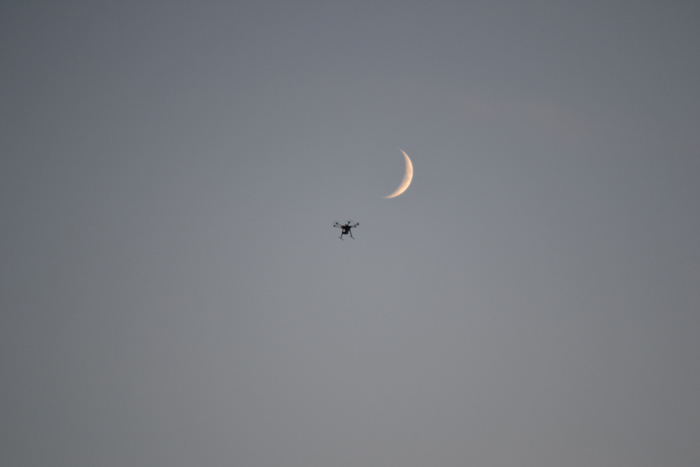 It appeared to stay under the proverbial radar and, before long, off it went into the night. After taking this shot, I went back inside where I grabbed a spot behind home plate and watched the remainder of the game. It was an exciting one between two above-.500 clubs. The home team slipped past the visitors 3-2. 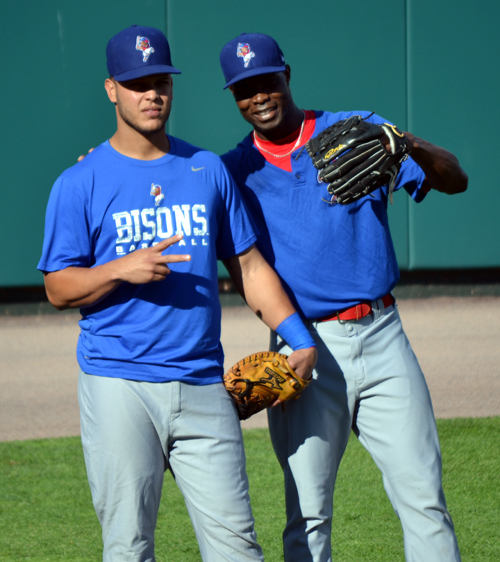 As a Jays fan, it was awesome to see so many prospects that I’ve yet to see in the Bisons colors or that I’ve seen on TV during brief stints with the big-league club. As great as the day had been so far, it continued to get better when I got to my hotel after the game. 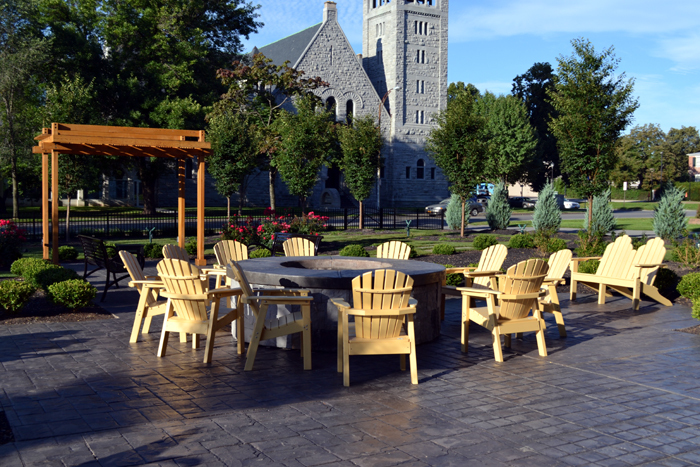 As you know, I love scouting out and staying at cool hotels in each city I visit, and I’d had my eye on The Strathallan in Rochester since I started planning this trip. 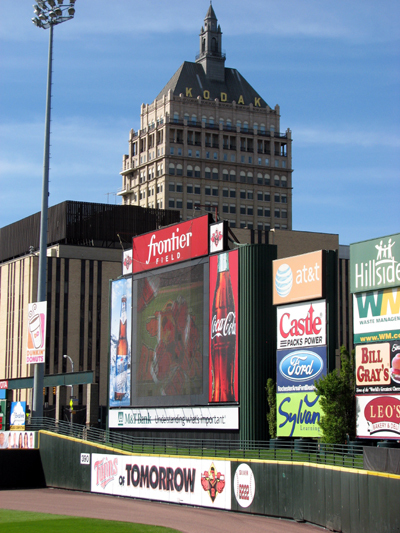 This hotel is an awesome choice not only for baseball fans visiting town, but also for anyone with Rochester on their travel agenda. 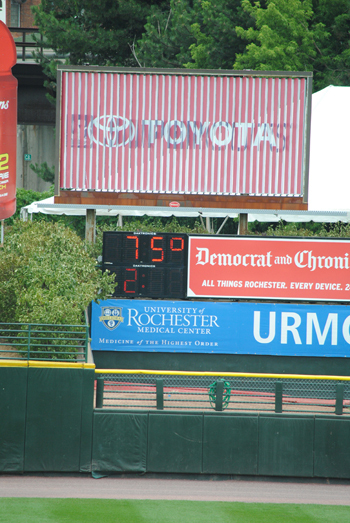 It’s only two miles from Frontier Field, or about seven or eight minutes, depending on traffic. As far as location, it’s actually on the edge of a residential neighborhood, so it’s extremely quiet. 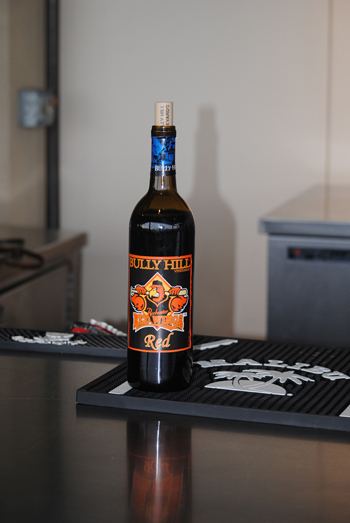 At the same time, you’re just a few blocks from several downtown eateries, so it’s the best of both worlds. The hotel is nine levels tall, and guests have access to the roof. 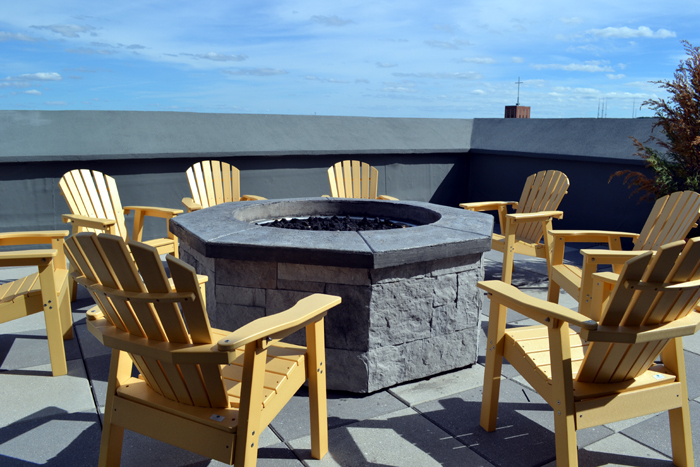 I rode the elevator to the top floor and had fun checking out the roof deck, which you can book for parties or meetings. 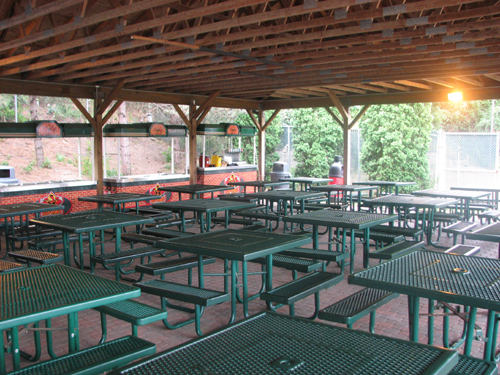 As I walked around, the pleasant smell of wood smoke was noticeable, but the fire pits weren’t ablaze. It took me a moment to realize I was smelling the wood-burning ovens at Char Streak & Lounge, the hotel’s upscale restaurant. I didn’t get a chance to eat here during my stay, but that didn’t stop me from salivating over its menu! 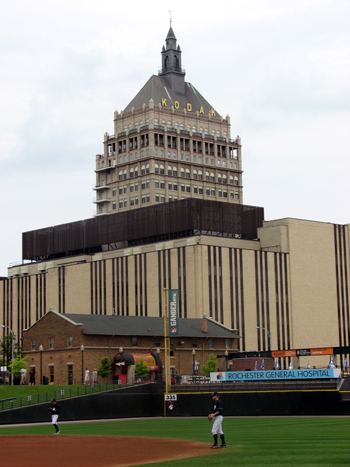 This hotel is one of the nicest I’ve visited, period, and will definitely be the place I hang my hat the next time I’m in Rochester to visit Frontier Field. Up next: A pair of outstanding days in Pittsburgh! 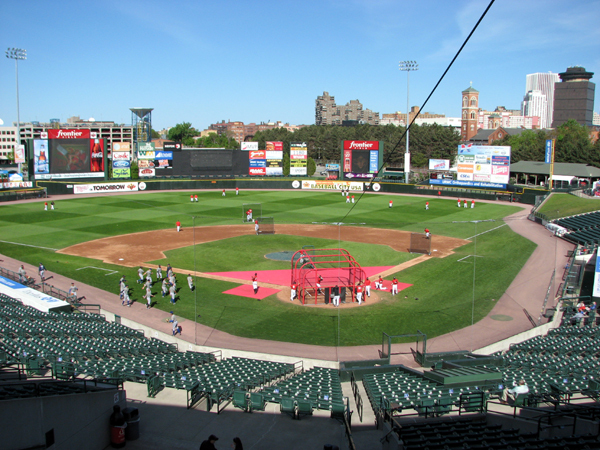 Way back in 2010, when I decided to visit as many MLB and MiLB parks as I could and start The Ballpark Guide, my first stop was in Rochester. 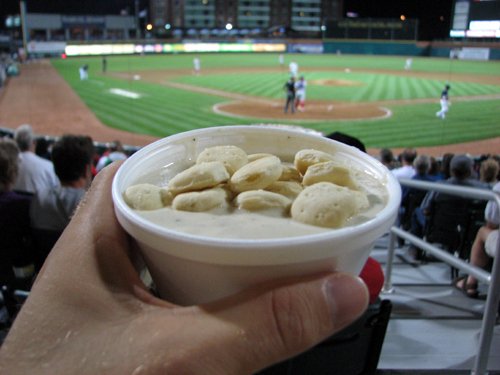 (If you want to read my first ballpark visit blog entry, you can do so here. Just excuse the wonky formatting.) 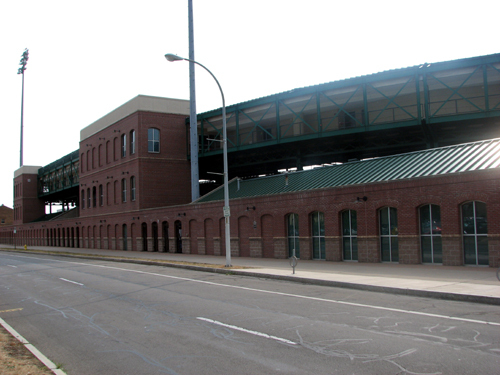 In the years since, I’ve thought fondly of Frontier Field and always looked forward to returning. 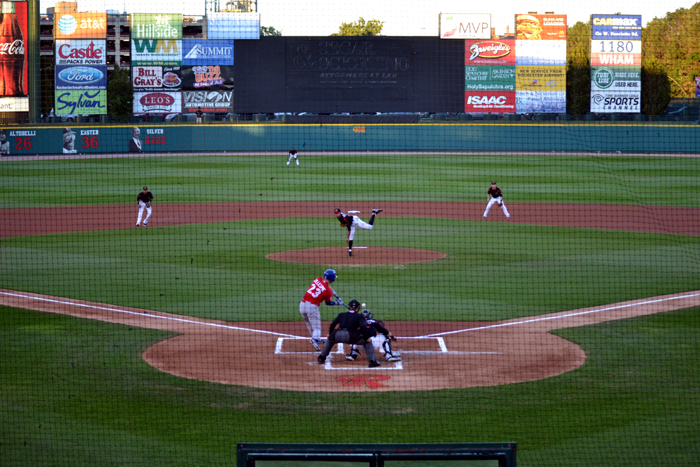 I got back to Rochester for another visit last summer, but when I was planning my current 13-day baseball road trip, I couldn’t resist starting out at Frontier Field. 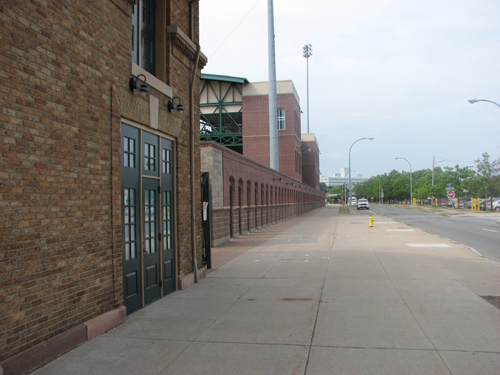 Silver Stadium was the home of the Red Wings from 1929 to 1996. 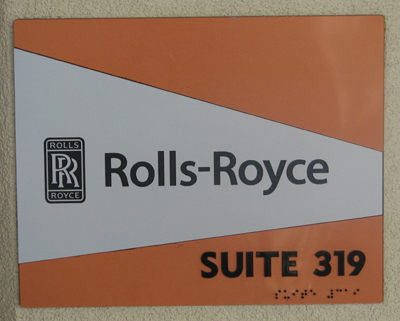 In fact, I plan to check out the site of the old stadium today before tonight’s game. 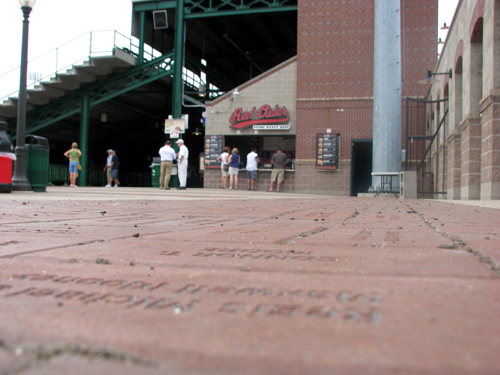 I’m a sucker for modern brick parks, as I think they do an awesome job of paying tribute to the history of the game. The wrought-iron bars and old-style lights really give you an feel of what a park might’ve looked like several generations ago. As much as the 1866 version of the game was different, it was neat to see how much today’s game is similar — despite its evolution. I think guys today are thankful for the gloves, though. 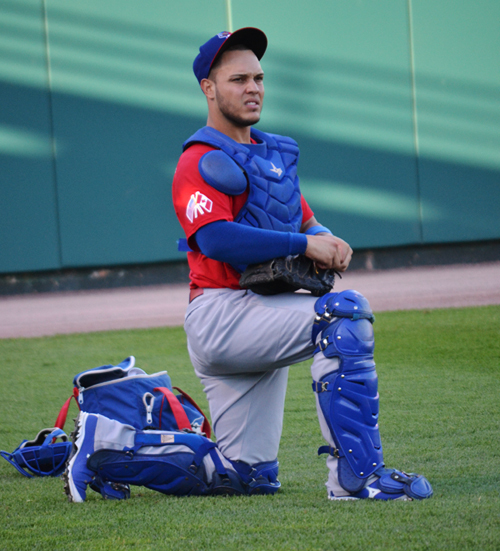 Imagine fielding a line drive with your bare hands. 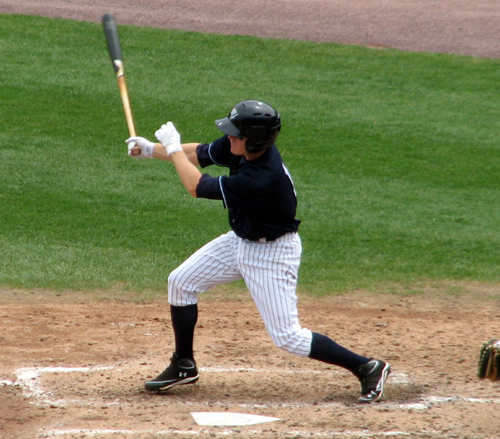 That’s Shelley Duncan, who’s played more than 300 games in the bigs and Tim Beckham, the 2008 first-overall draft pick. I wanted to take another full lap around the field before the game began in a few minutes, but the outfield was blocked off. 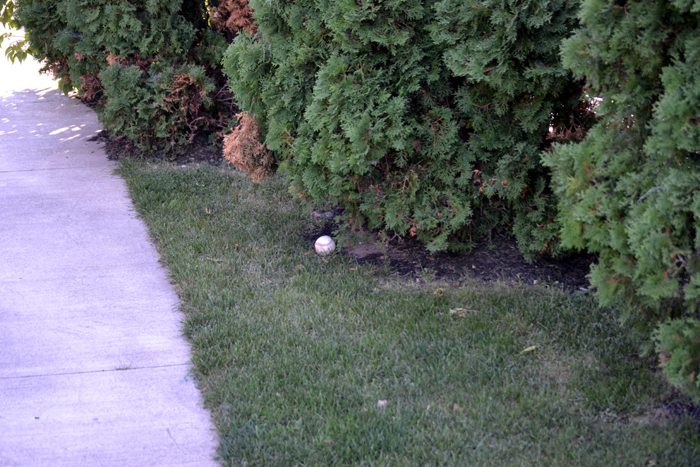 As I turned to head back toward the third base line, a baseball caught my eye. 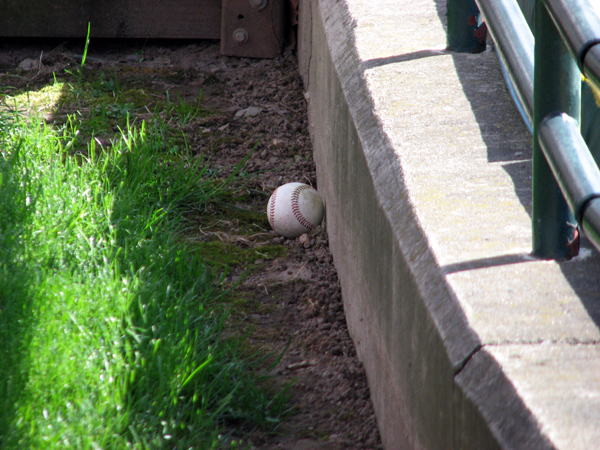 It was stuck in the fence directly behind the visitor’s bullpen. 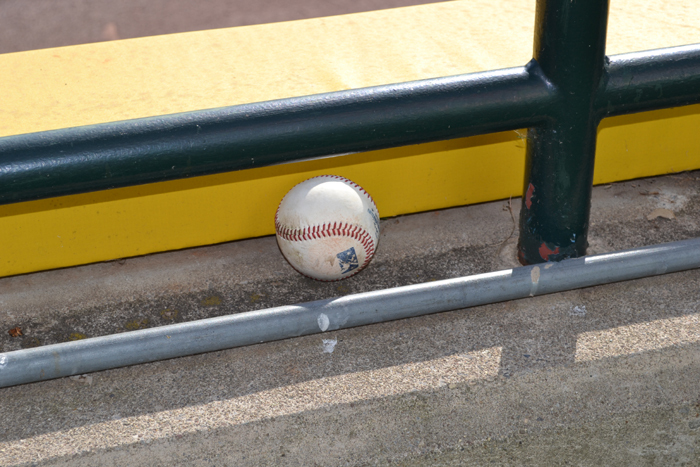 Since the gates had been open for nearly an hour, I didn’t feel bad about grabbing the ball. It was absolutely delicious and I can safely say it’ll crack the top 10 when I redo the list in the off-season. Wow! The view, however, was better than Myers’ results throughout the game. 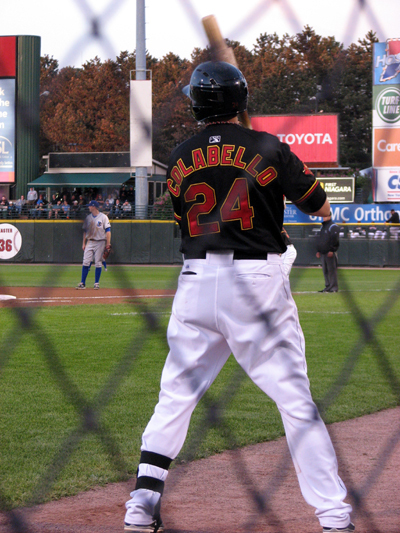 He went just 1-for-5 and left three runners on base. Again, absolutely incredible! 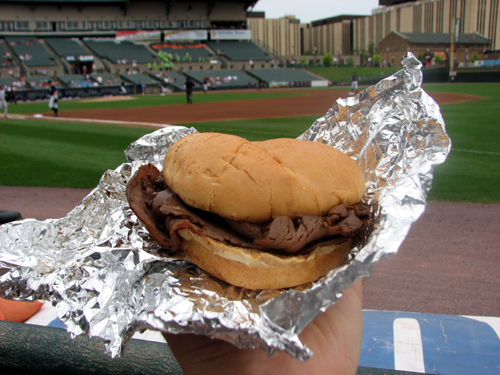 It didn’t taste like ballpark food; if I’d received it at a decent restaurant, I would’ve been more than happy. 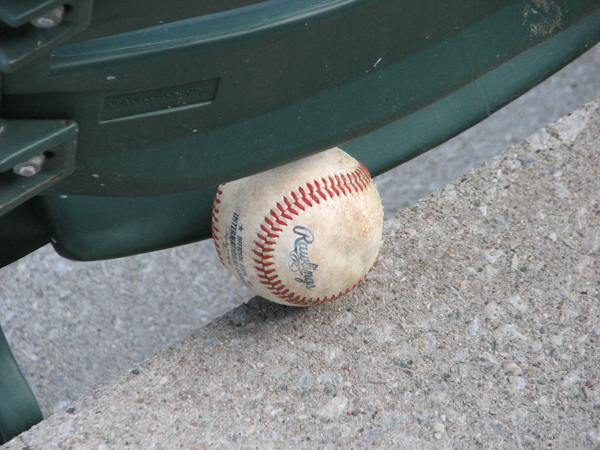 Funny thing about baseball — Rochester cruised through much of the game, leading 11-0 at one point. 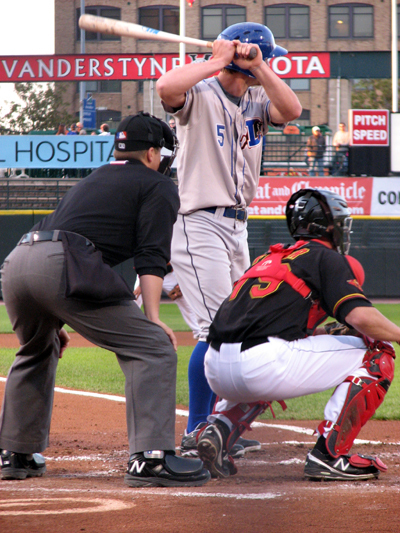 In the eighth, Durham’s offense went nuts and scored six runs. By the end of the once-lopsided contest, the Bulls had outhit the Wings 12-11. 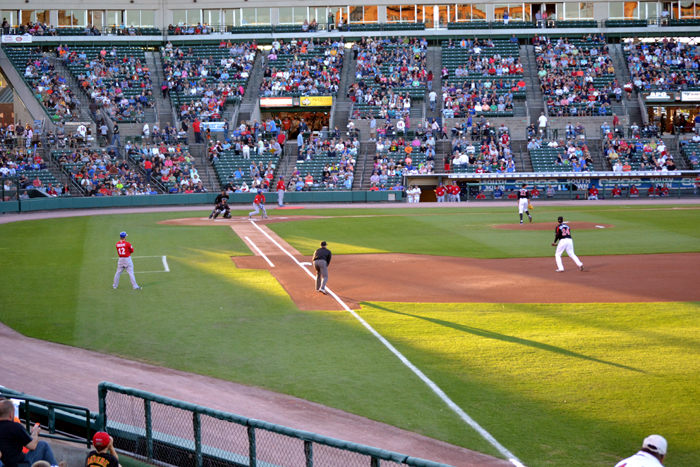 Yesterday’s visit just reaffirms how great Frontier Field is. 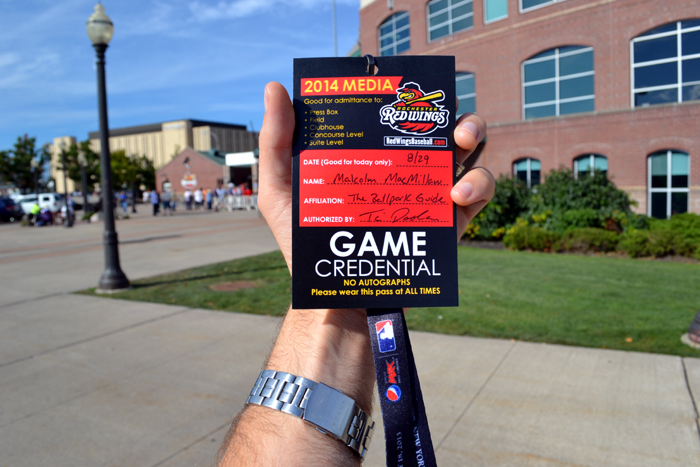 I’m already looking forward to getting back there later today for the Pepsi Max Field of Dreams game. 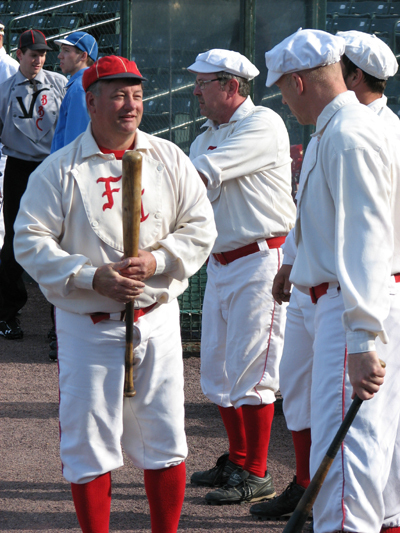 It features a bunch of retired MLB legends, and promises to be entertaining. 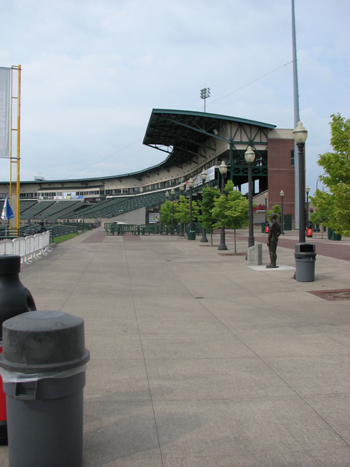 On July 17, 2010, I made Rochester’s Frontier Field the first ballpark I visited since coming up with the idea for my website, The Ballpark Guide. 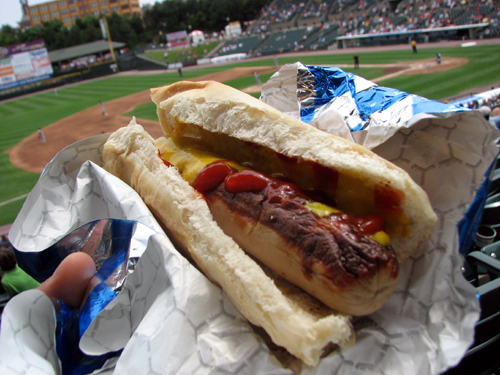 This past Thursday, almost exactly two years later, I made a nine-hour round trip to visit Frontier Field again. 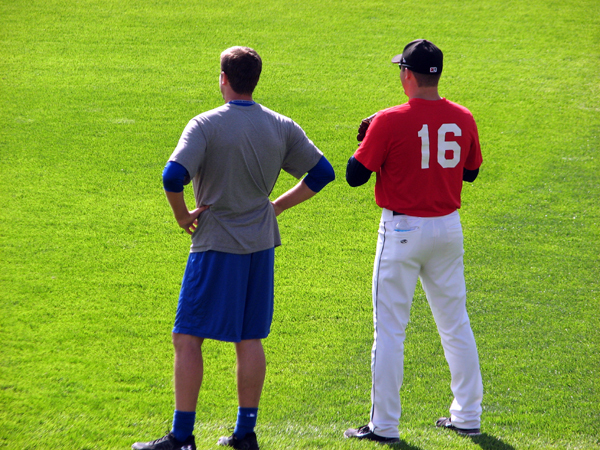 This time, I was joined by my photographer friend Ryan, who visited Centennial Field in Burlington, VT, with me last summer. So, the photos you’ll see below are a mix of his photos and mine. It’s my goal to eventually visit every MLB and MiLB park, which means repeat visits aren’t normally on the agenda. But ever since that first visit two years ago, I’ve looked forward to returning to Rochester. 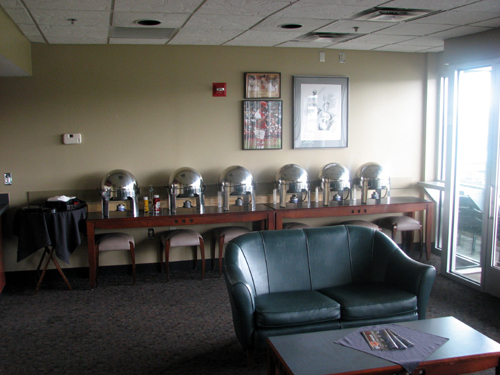 The ballpark is absolutely incredible, the food is amazing and the team has been extremely helpful and kind to me since the start. If those aren’t good reasons to go back, I don’t know what is. 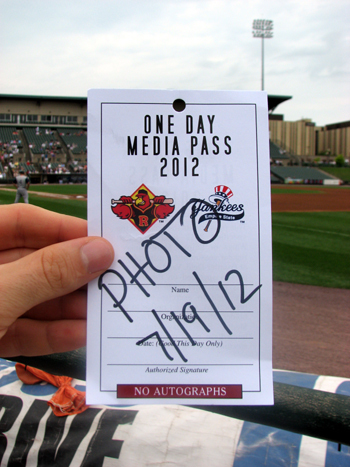 We had extra reason to be excited for this trip, because the Rochester Red Wings were giving us media passes and a pre-game tour before the park’s gates opened. A special shout-out to the team’s director of marketing Matt Cipro and account executive Derek Swanson, who were immensely helpful leading up to (and during) our visit. I’ve had a number of tours of different parks in the past, and they’re great because they give me a deeper understanding and appreciation for the park and all its features. This game was unique in that the Red Wings weren’t playing. 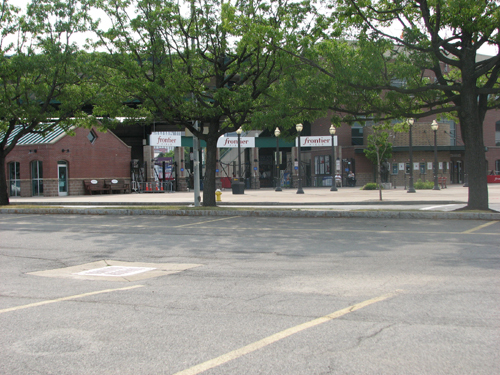 As you may know, Frontier Field is also being used by the Scranton/Wilkes-Barre Yankees this summer, as their home field, PNC Field, is under a major renovation. The pavilion in front of the gates was still quiet, and since it was a couple minutes before 10, we went into the park’s office to meet Matt and Derek. Soon, they arrived and Matt gave us our passes. Instead of a traditional media pass, we were given premium-level tickets to allow us to sit anywhere, as well as photo passes that would get us anywhere we wanted to be. 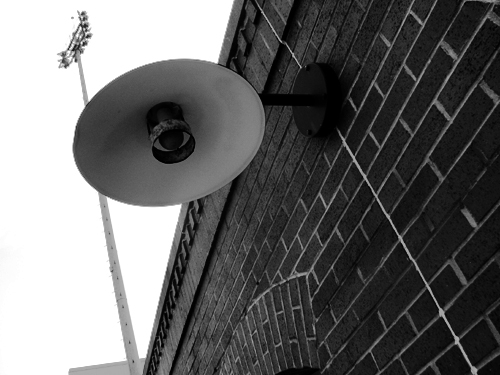 The entire time, Derek was telling us cool stories about Frontier Field, its history, its operations and pretty much everything you’d ever need to know. You could tell he loved his job and enjoyed taking people on tours. 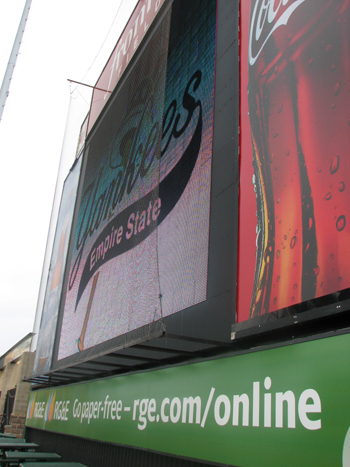 Derek explained that unlike a lot of MiLB parks, Frontier Field’s outfield isn’t overly cluttered with billboards. 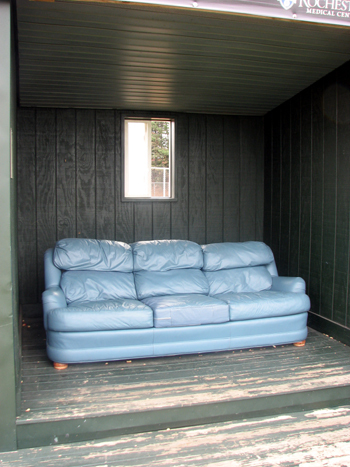 It’s mostly left open, which affords fans a great view of the cityscape. 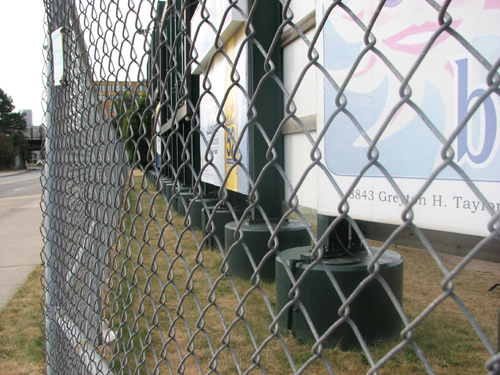 See the tan building behind the right field foul pole? There’s a cool story surrounding it. 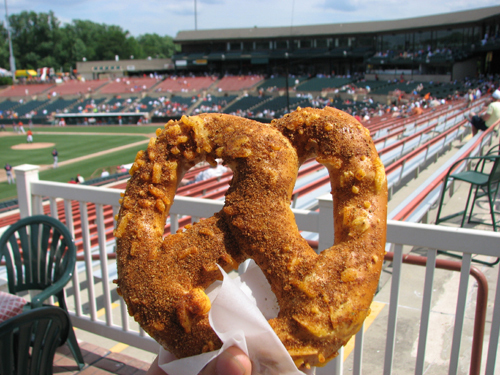 The Red Wings were affiliated with the Baltimore Orioles between 1961 and 2002, and when Frontier Field was built in 1996, it was built with the same field specs as Camden Yards, to give players a Camden Yards feel before they made it to Baltimore. 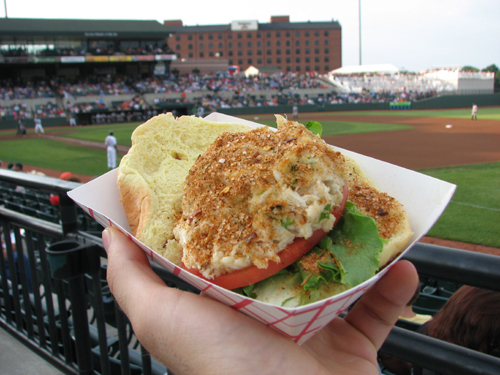 The ballpark was placed so that the tan building could represent the B&O Warehouse, which is one of Camden Yards’ signature sights. Cool, huh? In all, Derek spent about 75 minutes with us and gave us more information than I could’ve imagined. 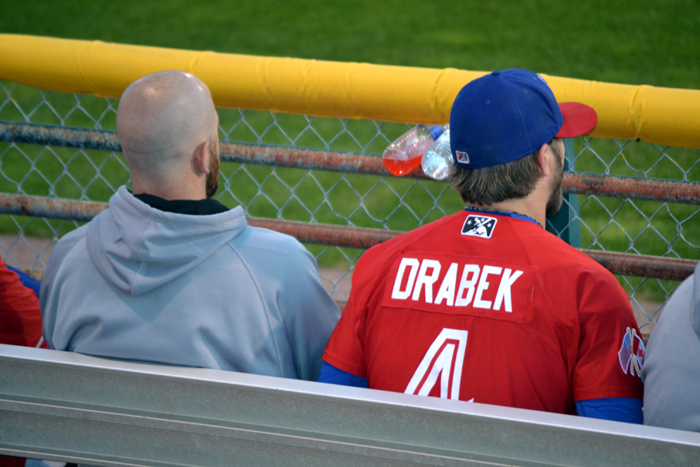 It was amazing of him to spend so much time with us, especially as the start of the game drew close. Thanks again, Derek! It was absolutely delicious. The meat seemed like actual prime rib, rather than brown-dyed mystery meat. I could’ve eaten three or four of these things. It was that good, and I definitely recommend it. 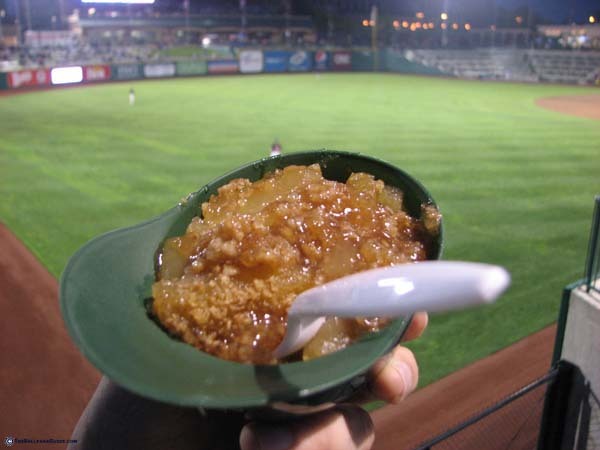 Remember that top 10 list of the best things I’ve eaten at ballparks? 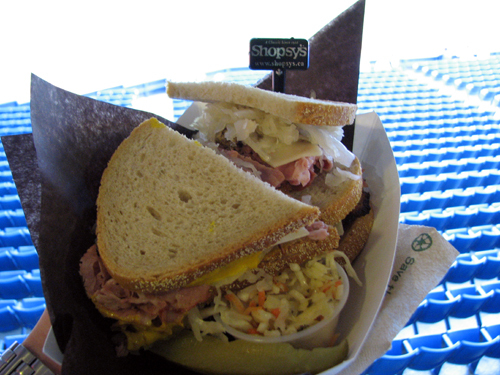 Let’s just say I’m going to have to revise it in off-season to include this sandwich. 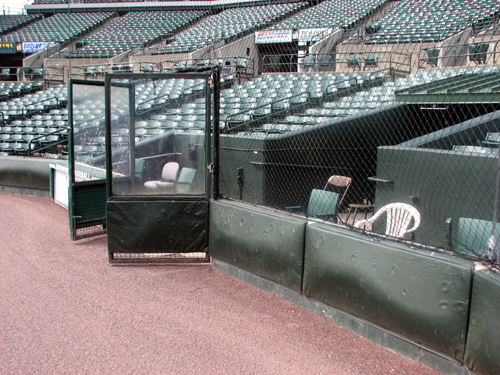 … and Fukudome appeared to wave at Ryan. It was hilarious and odd. Had I been blindfolded, I wouldn’t have known the difference between this dog and a regular one, although it’s not something I’d likely try again. I don’t know if it was just this one or all white dogs in general, but this one had a spongy consistency that I wasn’t crazy about. 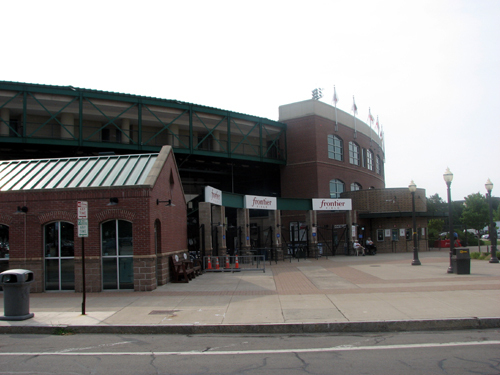 I’m definitely glad to have made a return visit to Frontier Field, and while I don’t know when I’ll get back again, I’ll definitely enjoy it when I do. Thanks to Matt and Derek for going out of their way to make our visit so memorable. I’m planning a road trip for about a month from now, and I’ll post details about it soon — probably sometime next week, once the details are ironed out. 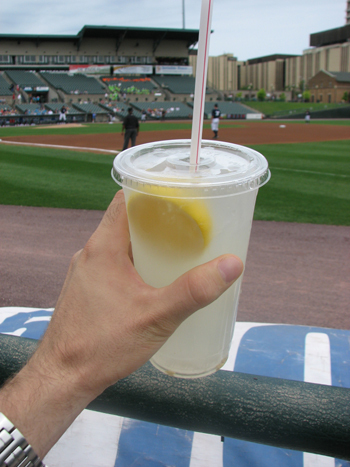 As always, please visit The Ballpark Guide to not only read comprehensive ballpark guides, but also to support my travels. Thanks! 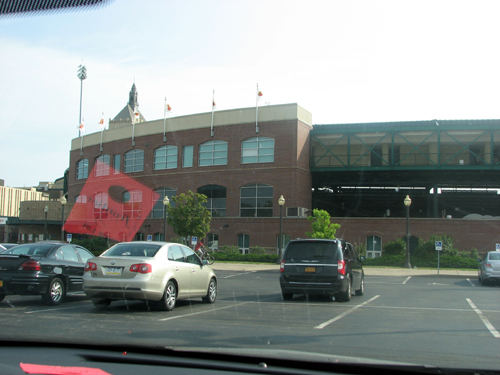 On the morning of Thursday, July 19, I’ll be hopping in the car when it’s still dark out and doing something that’s a symptom of my baseball obsession — driving about nine hours round-trip to watch a three-hour baseball game. Since then, I’ve been to more than 30 other parks on my travels. 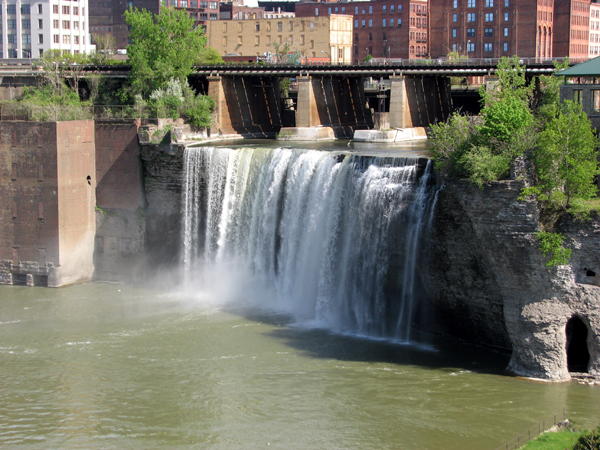 So, why the return trip to Rochester? Well, there are several reasons. 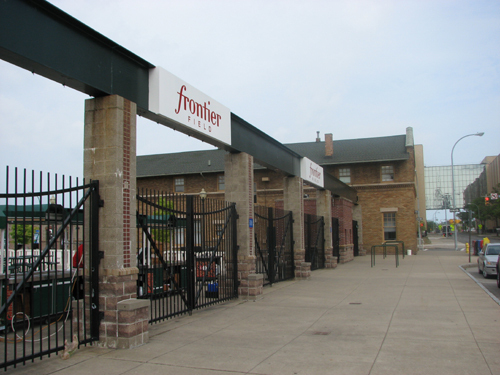 I absolutely loved the entire Frontier Field experience when I visited two years ago, and since Rochester is within day trip-distance for me, I’ve decided to go again. Although I normally travel solo, I’ll be joined on this trip by a friend who is also a photographer, and he’ll be helping me out by taking photos for my website. 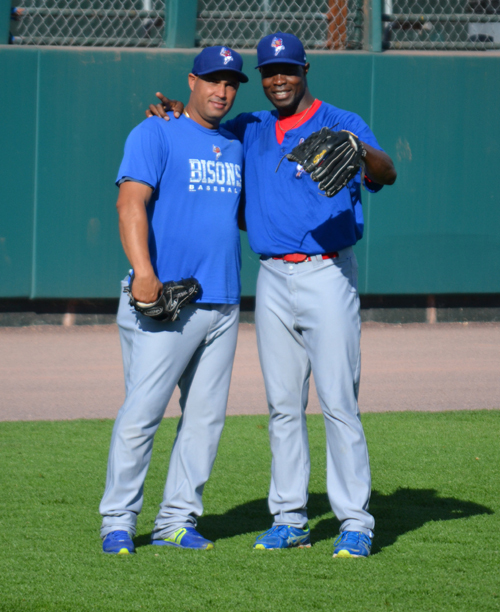 Last year, he visited Vermont’s Centennial Field with me, and you can check out a blog post about that visit here. 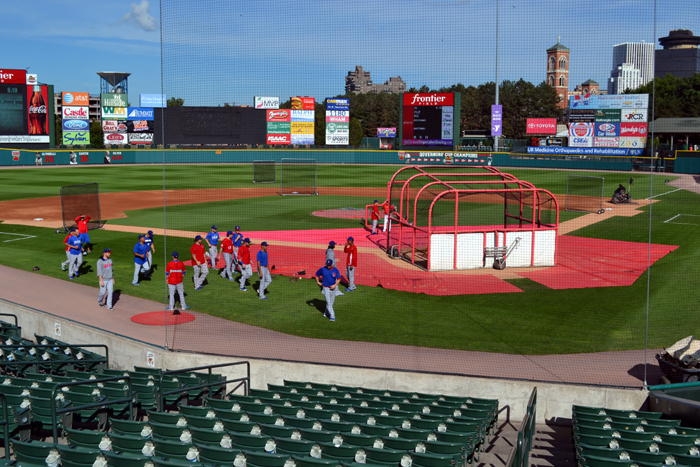 One of the unique things about this visit is that the Rochester Red Wings won’t even be playing. 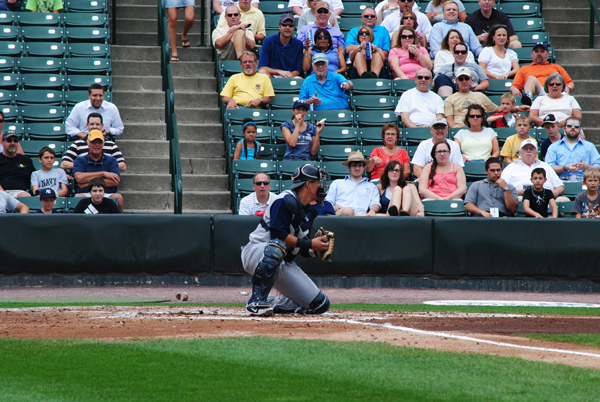 The Empire State Yankees (formerly the Scranton/Wilkes-Barre Yankees who are spending 2012 as a travel team) will be the home team, and they’ll host the Charlotte Knights. I may post a few goals prior to this trip, as I’ve done in the past, but either way, it should be a great day. 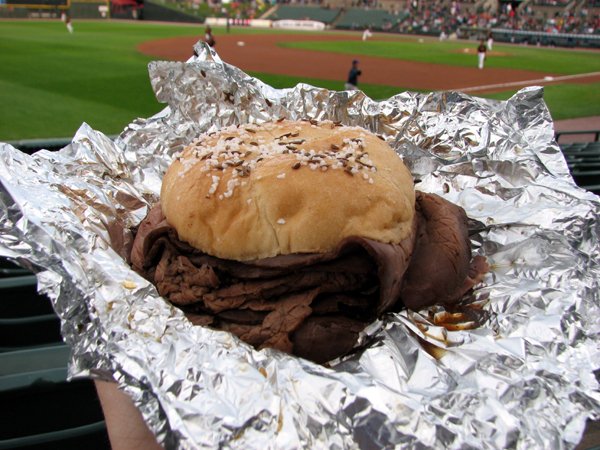 Ballpark food can be one of the best things about going to a baseball game. 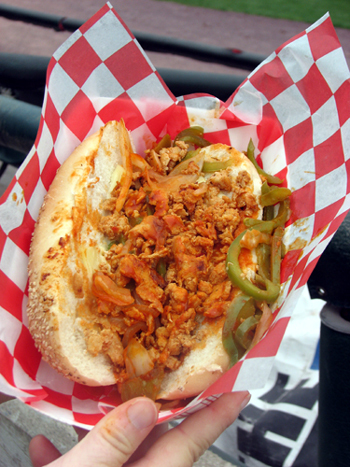 If it’s plain ol’ hot dogs and pop, it’s not necessarily noteworthy. 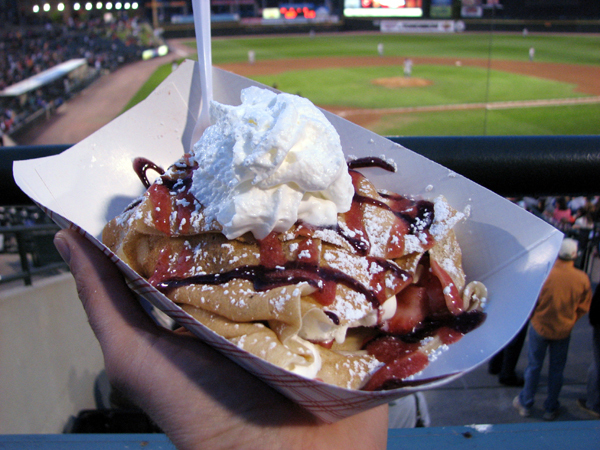 But if it’s exceptional food, like the fare served at Rochester’s Frontier Field, it can truly improve your whole experience. 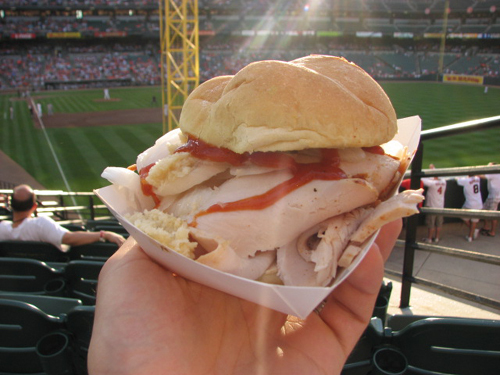 As you’ve read in previous entries, I’ve had a lot of positive food experiences at different ballparks. There are a few, however, that I want to highlight just for fun. 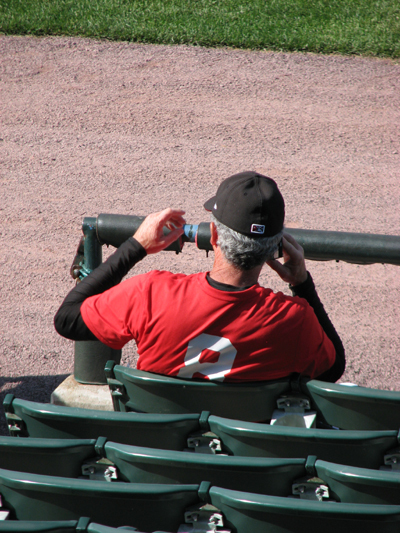 I’ve been to more baseball games that I can remember, dating back to 1988. 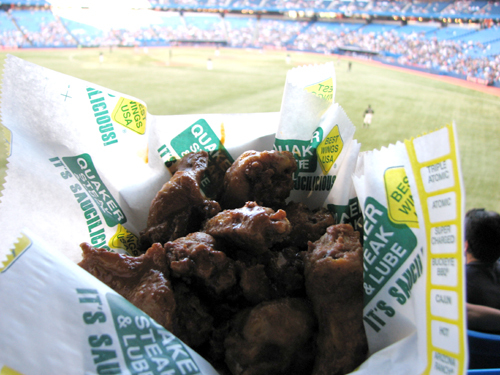 I’ve been to Toronto Blue Jays games at old Exhibition Stadium and SkyDome/Rogers Centre. 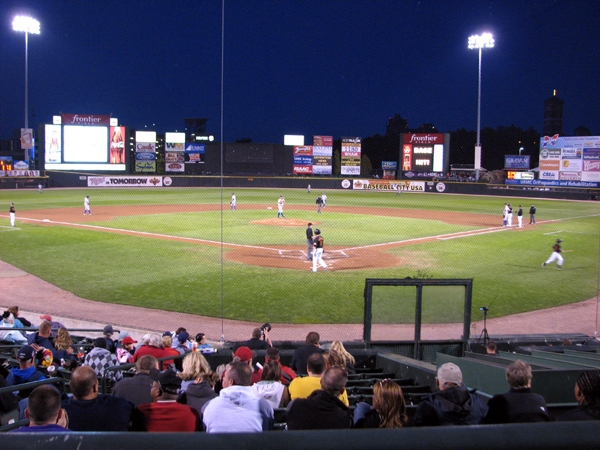 I’ve been to dozens and dozens of AAA Ottawa Lynx games in Ottawa, Ontario. 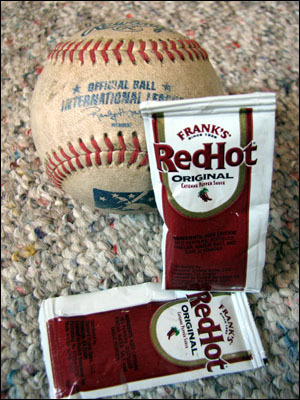 I’ve even been to a couple World Baseball Classic games in Toronto. 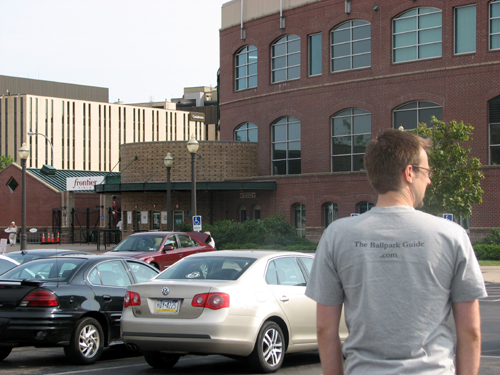 That said, I was pretty stoked the morning of July 16, 2010 as I loaded the car for my first baseball roadtrip of the summer. Why? 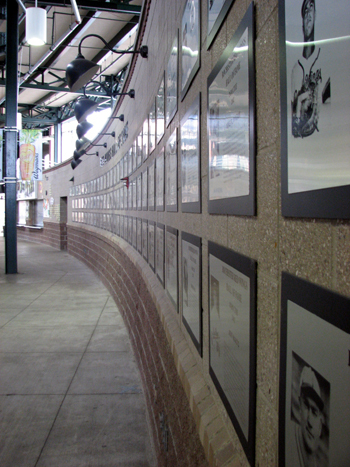 Because this would be the first baseball stadium I would visit for my new website, TheBallparkGuide.com. 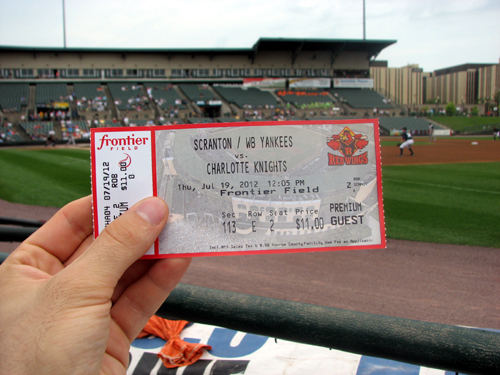 The plan was to be away from home for two nights, hitting three Minor League Baseball stadiums on my three-city journey in New York State. 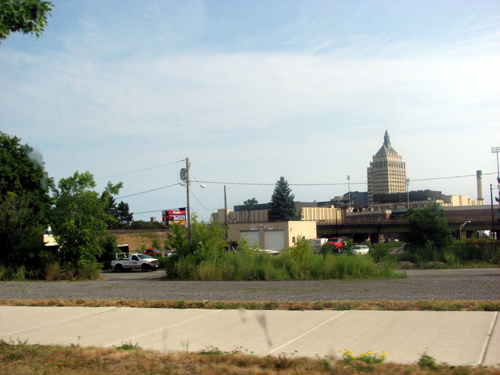 Rochester, the farthest destination, would be my first stop. I headed out late morning and the plan was to cross into the United States at the Ogdensburg crossing. That plan was all well and good until I got to the 1,000 Island Parkway, which had slowed to a turtle’s pace. It was a bad sign when a bunch of bikers beside me had turned off their motorcycles and were inching them forward by foot. 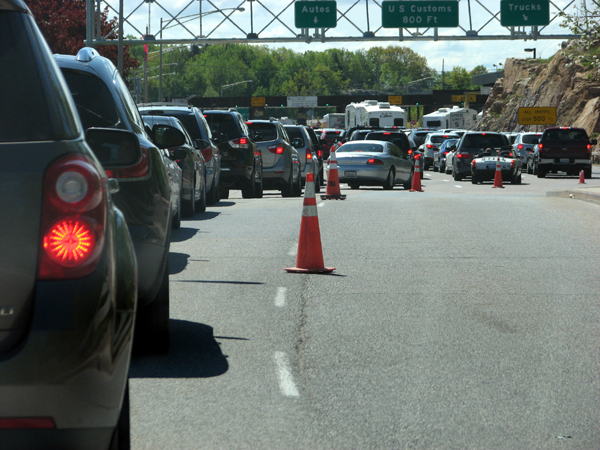 Here’s a shot I took of my Garmin Nuvi 255W GPS after a 30 minutes on the parkway. It was stop and go for 70 minutes, and I should’ve taken another shot of my GPS screen. Anyway, after 30 minutes, you’ll see my overall average was a frustrating 1 km/h. Awesome. After I paid to use the bridge (ugh), I passed successfully into the United States without much of a hangup at the border. I passed through Ogdensburg, Watertown and Syracuse and had to make a quick stop at the Waterloo Premium Outlets, just west of the ‘Cuse. The Under Armour store at the outlet has some ridiculous deals. 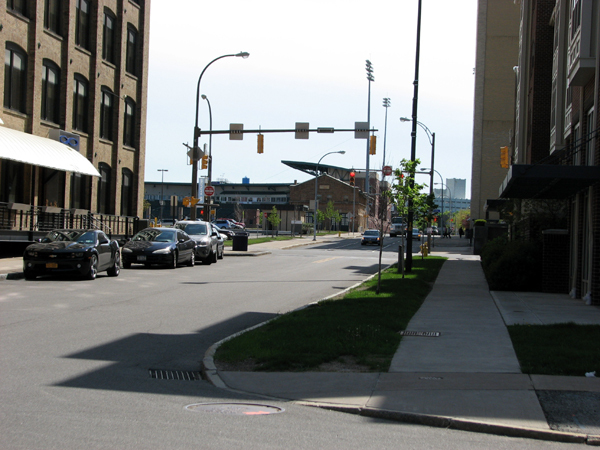 A little while later, I arrived in Rochester and made it to Frontier Field‘s neighborhood. As an aside, I’ve got to say how awesome it is to finally have a GPS. After years of thinking it was ridiculous to have someone tell you where to turn (and years of frustratingly getting lost in new cities) I decided to get a system prior to this first roadtrip. It was awesome. I know this should come as no surprise, but it led me directly to the stadium. And when one of the approaching roads was completely torn up due to construction, my trusty GPS gave me an alternate route. 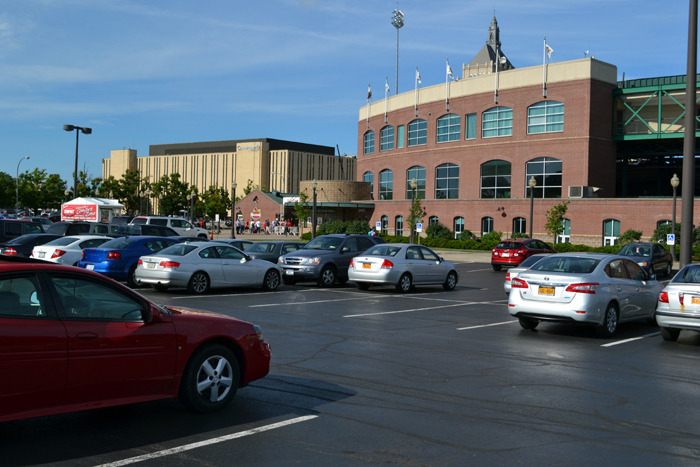 Parking at Frontier Field is a bit iffy. There’s a gigantic lot adjacent to the stadium, but it’s a trick. 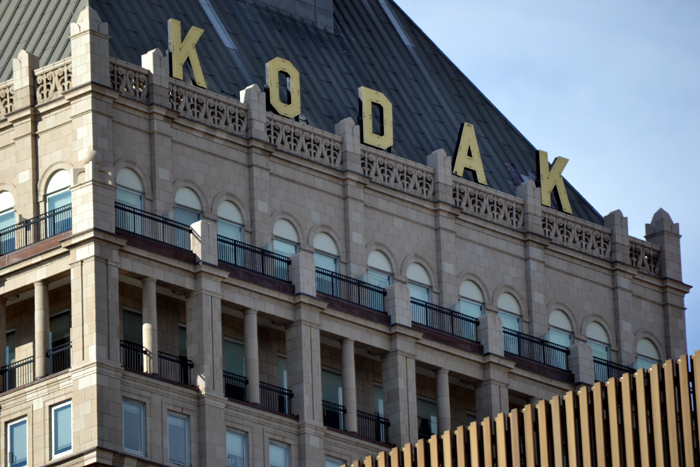 Most of the lot is for Kodak employees, as there’s a huge Kodak office almost across the street from Frontier Field. After driving into the lot, then doing the embarrassing reverse back into the street after the gate wouldn’t open because I didn’t have a pass, I drove around the block a time or two until I found the entrance to the stadium lot. 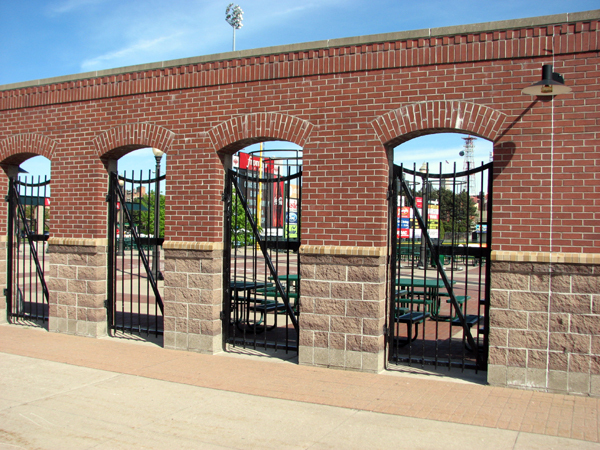 A moment later, I was roughly behind Frontier Field‘s centerfield, and took these photos of the stadium’s rear sign and gate: I then hurried back to the stadium’s main gate. It was largely empty when I first arrived, but it was now starting to get crowded. I got in line about 25 people back and couldn’t resist buying a program for $1. $1! This program was packed, too. Lots of cool stuff to read about the team while I waited. 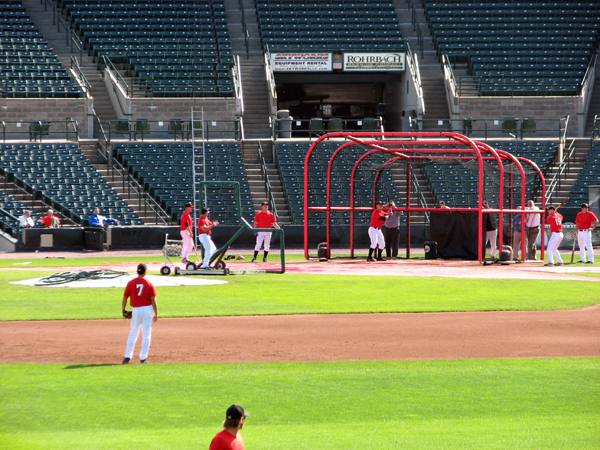 When the gates finally opened an hour before game time, I ran in and took a bunch of photos. The horse was pretty neat, though all the gloves were covered in people’s names. I’m not sure if this was done prior to it being built or by vandals after it was put on display. 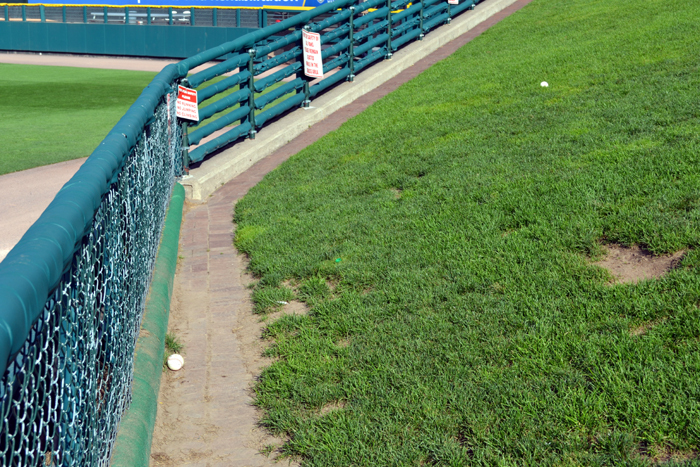 And here’s a pretty pristine-looking outfield. 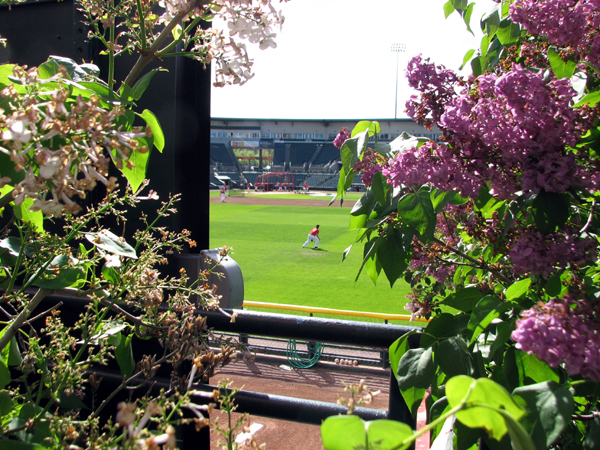 You’ve got to admit that Frontier Field is beautiful. 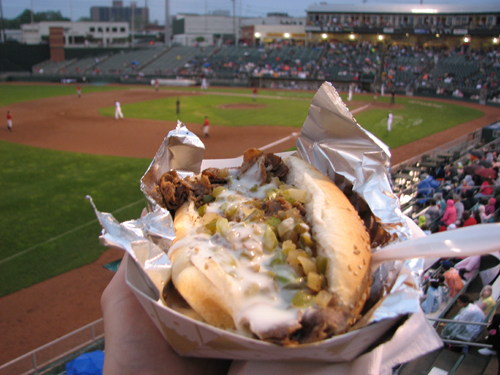 It’s only a AAA ballpark, but its quality is Big League. 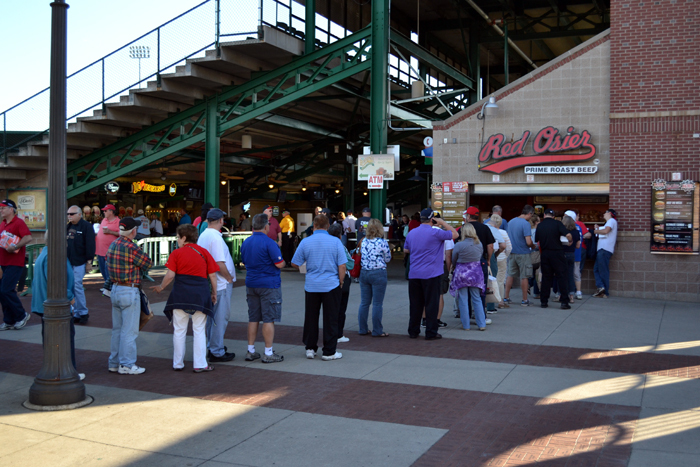 A little under an hour before first pitch, the Red Wings have one player sign autographs in the concourse. 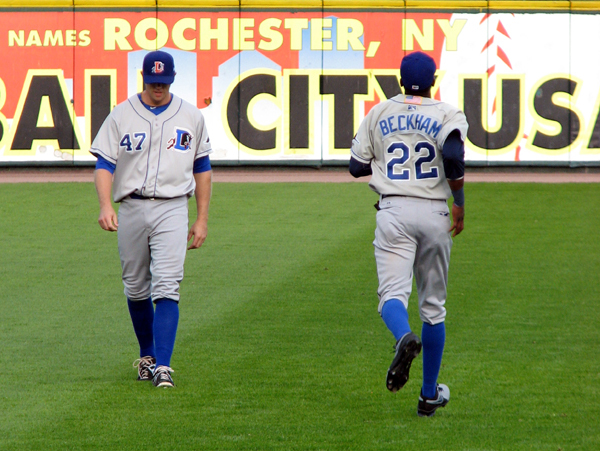 I headed that way and found it was outfielder Brian Dinkelman. 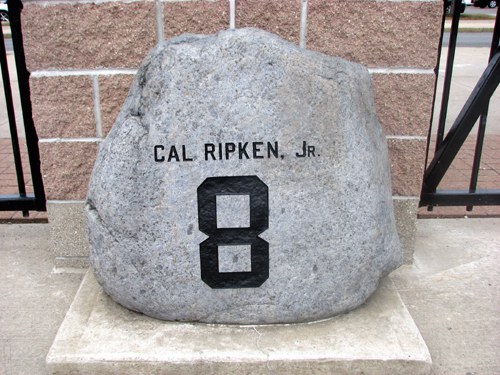 Dinkekman went to McKendree College, where he still holds 25 of the school’s all-time baseball records. I got his signature on my team ball. 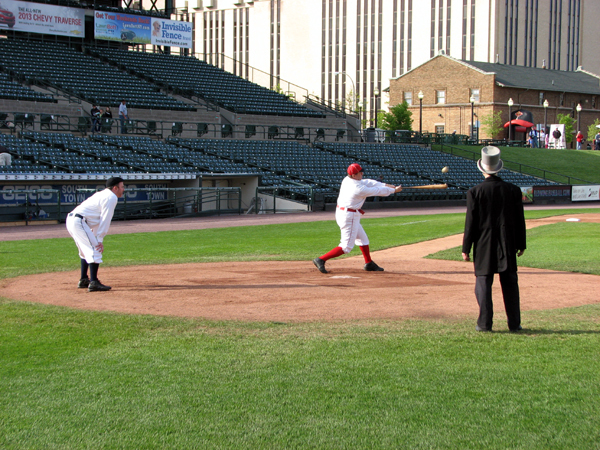 Did you know that Baseball America named Rochester as Baseball City USA? I didn’t. 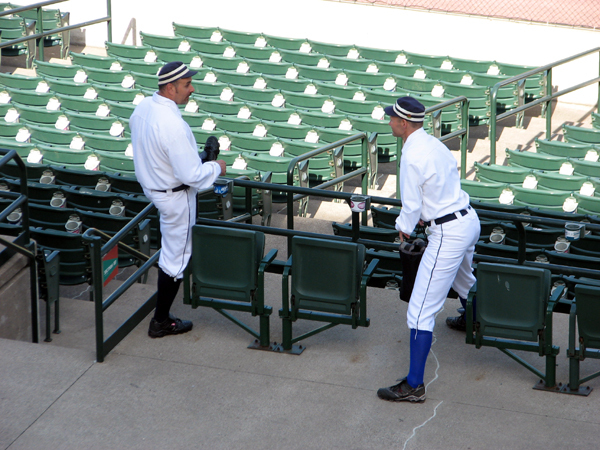 And by the time the first inning was over, I’d had enough of my seat. Crammed up against a couple nerds talking about work and checking their BlackBerrys every two minutes? Ugh. 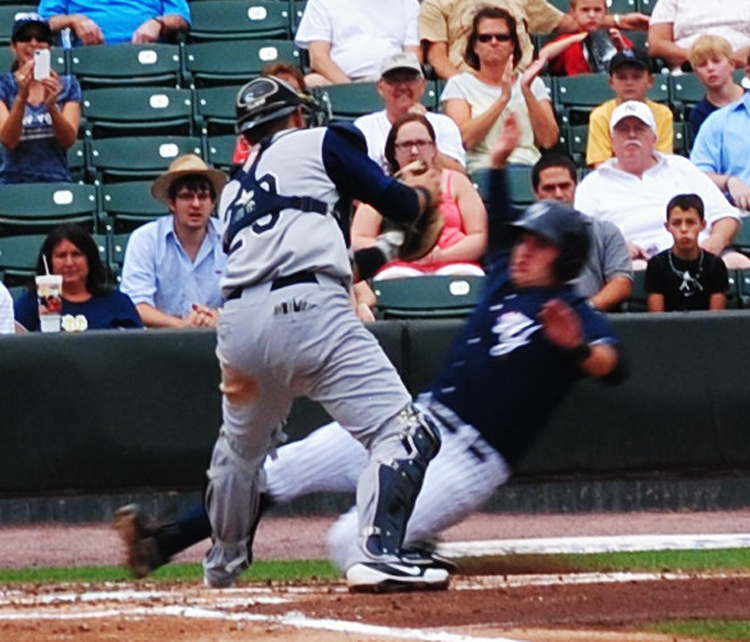 I love moving around during ballgames, so I was on the move again. 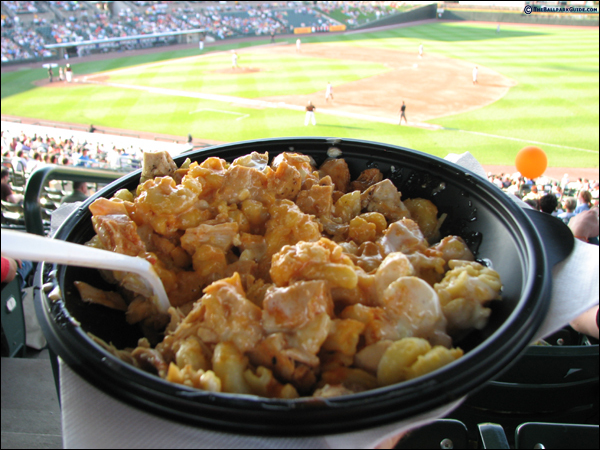 Between innings, I hit the concession stand where I bought buffalo chicken mac and cheese. That’s right. 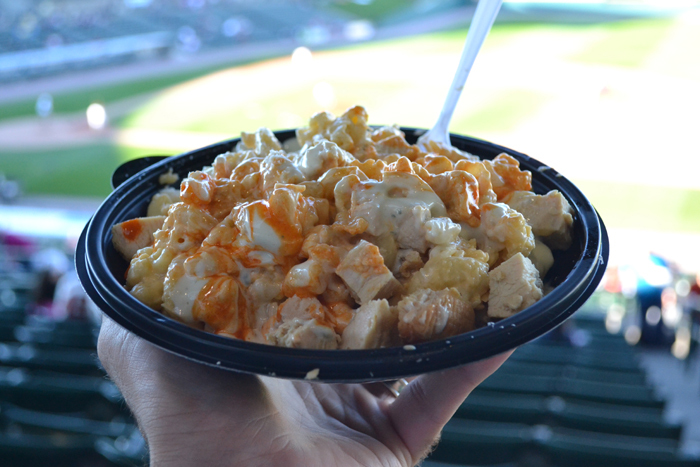 It’s a big bowl of mac and cheese with chunks of chicken, Frank’s Red Hot Sauce and bleu cheese dressing. It was amazing! 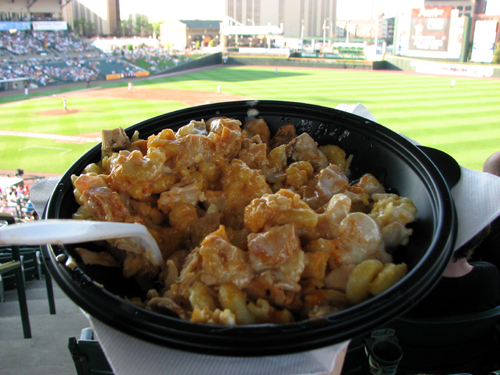 I have to say that Frontier Field might have the best food you’ll find at a Major League or Minor League park. I’ll correct myself if I’m ever proven otherwise, but Rochester serves up some amazing grub. 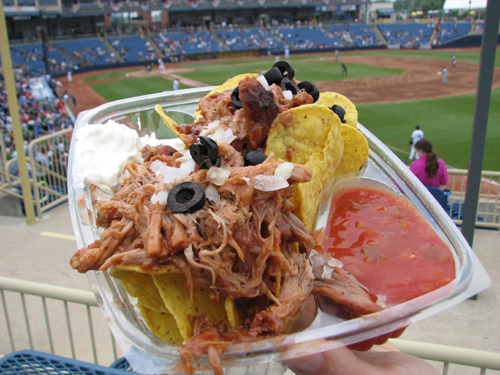 In addition to typical ballpark food, there was a gluten-free vendor, a variety of Italian food and a bunch of other great-looking stuff. The mac and cheese filled me up, but next time I go back to Rochester, I’m going with an empty stomach. 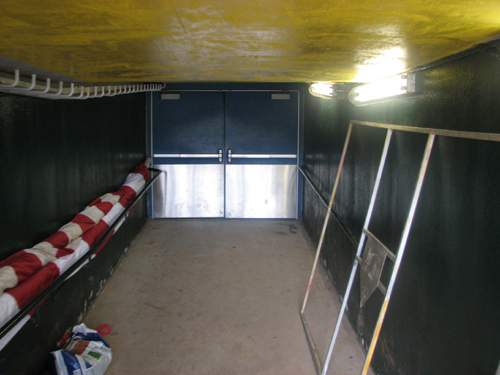 After the game, I ran back to the main concourse outside the stadium and waited near the players’ parking lot. 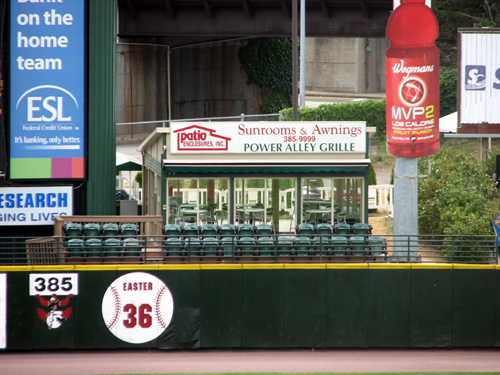 I read some great advice about autograph collecting at Frontier Field on SportsCollectors.net, and quickly found the area was littered with other autograph collectors. I grabbed a bunch more Red Wings on my team ball and ended up with about 10 signatures, give or take. 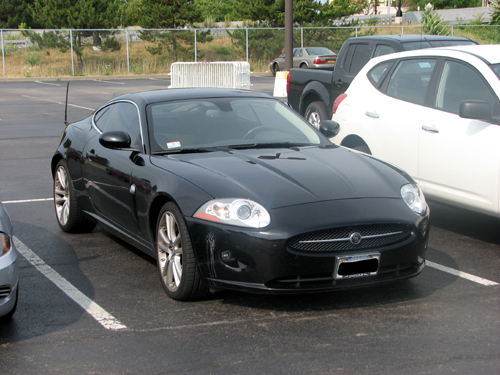 Afterward, it was back to my car and onto my hotel. I booked my hotel through Hotwire. Ever use that site? 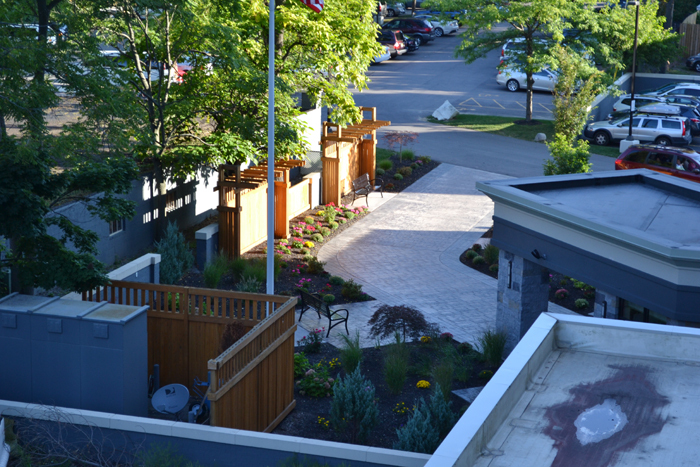 Its premise is you get your hotel cheaper than anywhere else, and I’ve typically had pretty good luck with it. You pick how many stars you want, and in what area, and the catch is you don’t know what hotel you’ll get until you book and pay. In this way, it’s a gamble. It’s sweet when you make out better than expected and miserable when you don’t. On this night, I was headed to Extended Stay America. Huh? 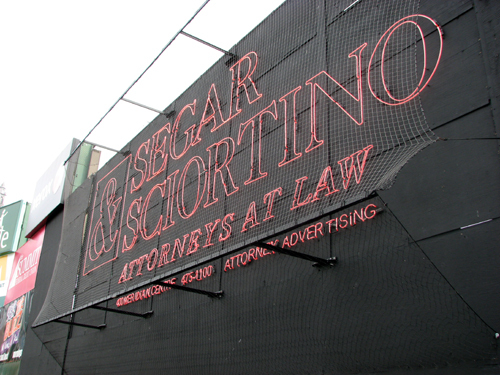 This wasn’t a chain I’d heard of, and I’d read it was located in a strip mall. That turned out to be untrue; it was only beside a strip mall. I cautiously checked in and hopped into the elevator. I have a theory about hotels. 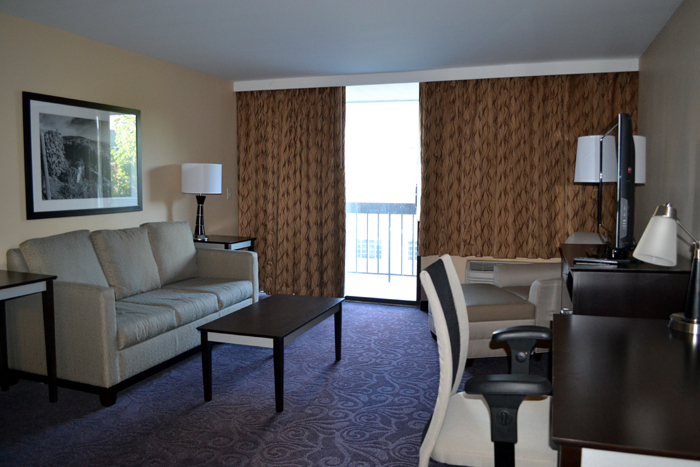 If the elevator is clean and not shady, the guest rooms are nice. 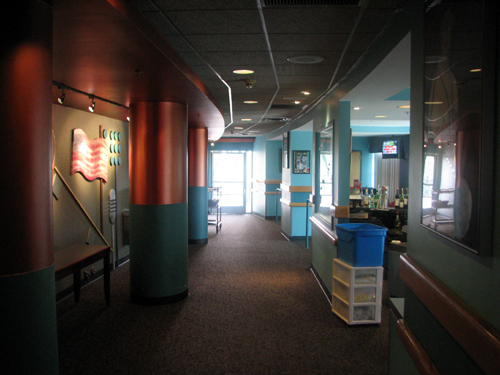 If the elevator is gross, the rooms will be, too. The Extended Stay elevator was neither clean not secure feeling. You know those elevators that feel like they’re about to drop? This was one of them. 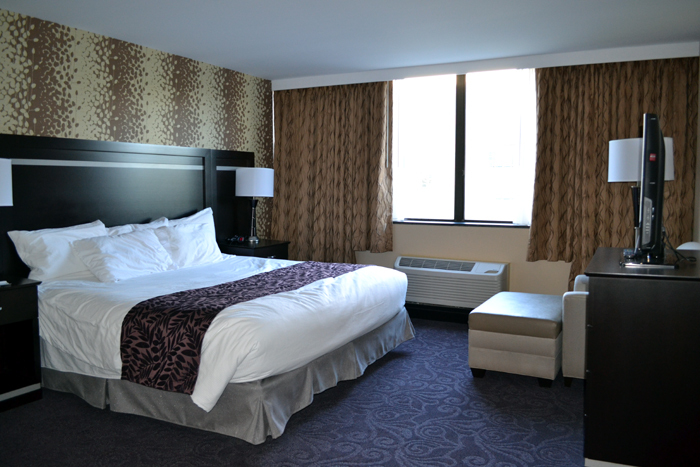 Anyway, the room proved to be fairly plain and while it wasn’t exactly clean, it was passable for around $60. The downside was its single bed (ugh) and while it had a full kitchen, it wasn’t anything I’d consider putting edibles near. The end of an excellent first day. 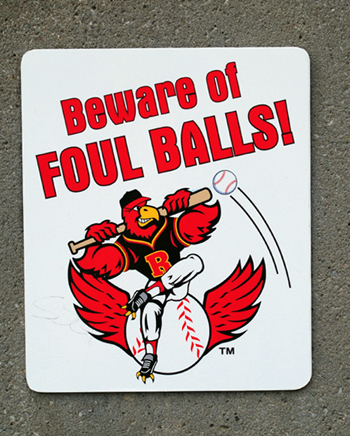 On to Auburn’s Falcon Park tomorrow!